Transparency Market Research has published a new report titled, “Connected Car Device Market - Global Industry Analysis, Size, Share, Growth, Trends, and Forecast, 2018–2026”. According to the report, the global connected car device market is anticipated to surpass US$ 20 Bn by 2026, expanding at a CAGR of more than 11% during the forecast period. Demand for vehicle connectivity driven by consumers, government, insurance companies, and auto manufactures is expected to rise at a steady pace during the forecast period. Connectivity services such as navigation, infotainment, entertainment, usage-based insurance, and security are witnessing high demand promoting the use of connected car devices. In terms of sales, the demand for retrofit solutions, i.e., the OBD dongle, is expected to rise till 2023. Retrofit connecting devices can be utilized by all vehicles registered after 1996, as they contain an OBD port. Retrofit devices have independent hardware and software and hence, are highly cost-effective as compared to built-in devices. Automakers are investing significantly to build proprietary built-in solutions for car connectivity. Strong emphasis by governments of countries in Europe and the Government of Brazil to mandate embedded telematics in cars is estimated to boost the built-in segment of the connected car device market. Sales of retrofit connecting devices are expected to suffer post 2021, as a majority of new vehicles are likely to contain built-in connected devices. Increasing importance of smartphones and apps is expected to drive the smartphone sub-segment of the built-in segment of the connected car device market during the forecast period. In terms of vehicle type, the heavy commercial vehicle segment is expected to expand significantly, as fleet truck operators are integrating telematics with truck platooning and hence, it has become imperative for trucks to be connected. Connected trucks overcome several challenges faced by the trucking industry, such as managing fleet operation, driver management, freight efficiency, and fuel consumption. 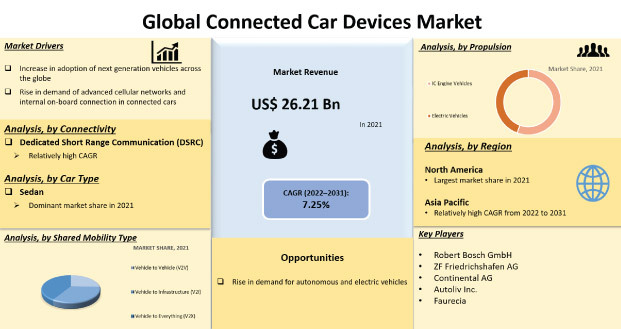 Based on region, the global automotive connected car device market has been segmented into North America, Latin America, Europe, Asia Pacific, and Middle East & Africa. Europe held a prominent share of the market, in terms of volume, in 2017. However, Asia Pacific is expected to lead the global market by 2026, owing to the rise in demand for connectivity in China and India. China also is a major supplier of retrofit connected car devices, globally, due to low cost of the hardware in the country.